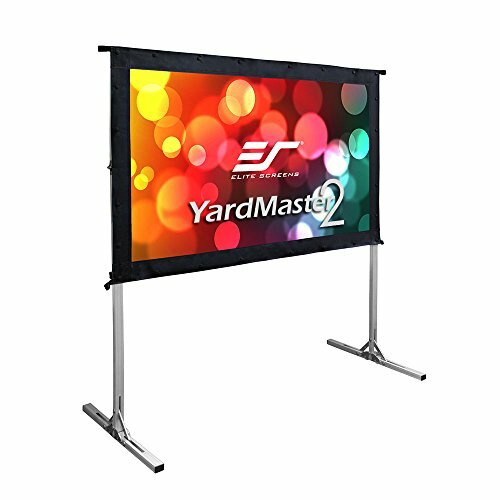 Elite Screens Yard Master 2 Series is an excellent choice to deliver the most impactful personal or business presentations. This free-standing projection screen is the perfect companion for outdoor presentations with front or rear projection materials available. 58-inch Diagonal, 16:9 Aspect Ratio. View Size: 28.4" H x 50.5" W. Overall Size: 56.3" H x 53.1" W x 36.7" Leg Size. Silver Aluminum Frame. Assembles in minutes without the use of tools! Lightweight aluminum square tube construction easily transports with included padded carrying bag. Screen is mildly weather resistant, but should not be left exposed to the elements for extended periods of time. For maximum longevity, disassemble screen and store away indoors.